Alfalfa fields are divided into long bays called “checks” that are divided by low berms. Each check is flooded from the highest end, and the water flows in a sheet to the lower end. It is difficult to estimate when to shut off the water at the right time to prevent runoff. The checks tested in this project are about 220 m (720 ft) long and 15 m (50 ft) wide. During the course of the project, the current practice for determining when to cut off the water supply was compared to a more automated method using dataloggers and sensors. 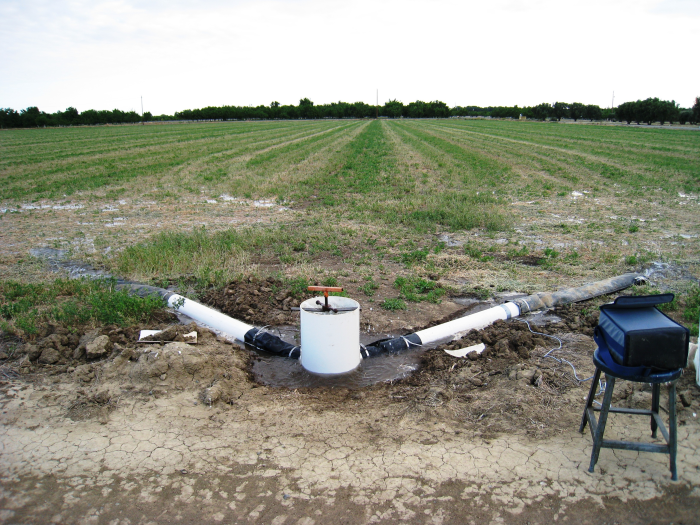 For the new, more automated method, the research team designed a system in which three water sensors were buried, spaced in a row (following the direction of the water flow) toward the lower end of the check. As the water sheet proceeded down the field, a Campbell Scientific CR3000 Micrologger recorded the arrival of water at each sensor, and used a cell modem to transmit that information to the irrigators.